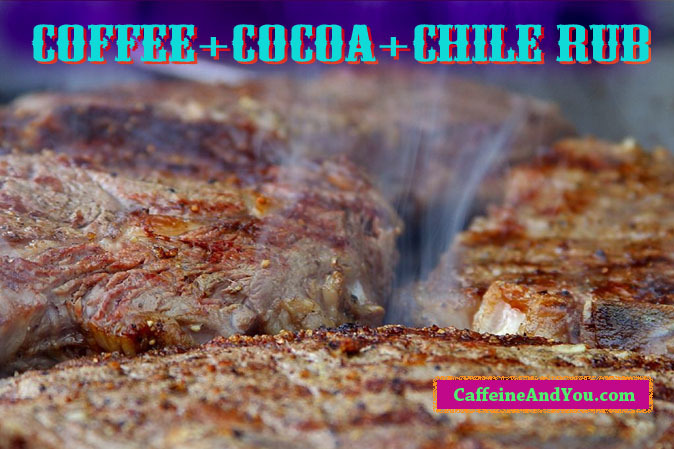 A pot of cowboy coffee and steaks on the campfire? Hmmmm…. maybe a backyard grill and icy margaritas instead. Whether you’re heading out West or out back, punch up your menu with this aromatic rub. I love mixing this blend just to smell the seductive aromas of coffee, cocoa and chile – the three C’s. Plus, this rub radiates a warm kick from smoked paprika, mild and fruity ancho chile, allspice, and cinnamon. It’s richly seasoned, but not tongue-burning hot. Try the rub with the marinade below for the perfect combination of flavors. This makes enough for 2-3 steaks, but you can double or triple the recipe. I’ve included measurements by weight, so it’s easier to whip up a large batch. Coffee, cocoa and chile are all rich in antioxidants. Use an arabica coffee bean here; it’s less bitter than robusta. Combine all ingredients. Rub about 1 tablespoon on each steak (both sides). Leave on as a dry rub or marinate before grilling. Pat on about 1 tablespoon spice rub on both sides of each steak. Marinate 2 sirloin or other steaks in 1 tablespoon each of olive oil, balsamic vinegar, and soy sauce. Refrigerate 2 hours or overnight before grilling. Other uses for the rub: Kick up chili con carne for a boost of flavor, not heat. Add 1-2 tablespoons rub to a pot of chili, slow-cooker pork, or taco meat. Sprinkle on halved winter squash before baking, or mix into mashed sweet potatoes. Go Bollywood this weekend: The Mehndi Cocoa Paint design shown here uses a doily as a stencil, with added flourishes from a paintbrush. Mehndi skin designs predate Bollywood by a few centuries, dating back to ancient India as a ceremonial art form of body painting. Brides and grooms are adorned with intricate mehndi patterns and symbols, usually on hands, palms, and feet. It’s also worn for festivals and other special occasions in countries stretching from the Sudan to South Asia. Mehndi (or mehendi) is made from henna, a type of plant, and though the stain isn’t permanent, it will last for weeks. The traditional color is a reddish brown, though black mehndi made with toxic additives is also sold. For best results, apply it to smooth skin areas that won’t be getting wet for a while: around the ankles, upper wrists and arms (not on palms), cheek, as an armband or necklace, or as a shoulder tattoo. It should last several hours, long enough for a night on the town or an all-day wedding. Ideas: Ocelots, leopard, tiger and zebra prints. 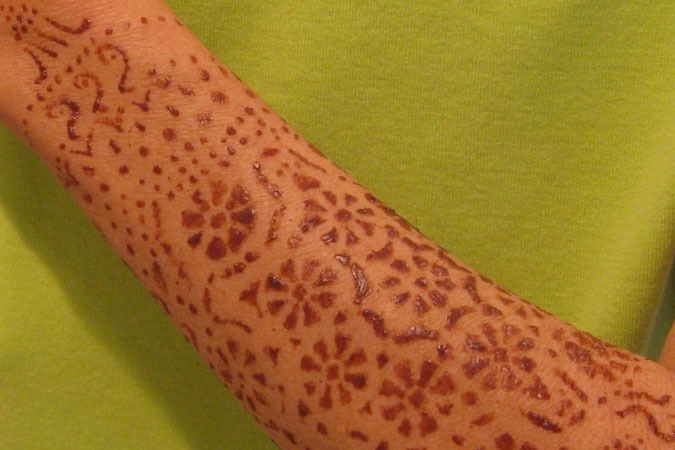 Paint a wild pattern using Mehndi Cocoa Paint – for a fab fashion statement or a Halloween costume that’s literally skin deep. • Remove any clumps or thick strands from the egg yolk, for a smooth consistency. • A thick mixture leaves a slightly raised texture, which may be desirable. But don’t dab it on too thickly, or it will crack off. Thin with a drop of water if it thickens while standing. • Dab on fine dots with the point of a skewer or fork tines, or paint on with a very fine brush. • Wash the mixture off with soap and water; it’s not waterproof, but will resist a light rinsing. • Use pre-made stencils or cut your own from plastic or paper. Doilies make great stencils. Use masking tape to hold them in place. • This recipe makes enough for one fully designed arm, and may be doubled or tripled. 1. In a small bowl with a small fork (like a cocktail fork), beat the egg yolk with the water. Remove any thick clumps of egg yolk. Beat in the molasses and cocoa powder, stirring until smooth. The cocoa powder may resist dissolving, but keep stirring. The mixture will be syrup-like, and will thicken as you use it. 2. With a fine paintbrush, apply designs to dry skin. Or, with masking tape, secure a doily (or stencil) around the wrist or arm; rinse a fine sponge and squeeze dry. Dab the paint over the doily. Allow a few minutes for the design to dry thoroughly. Who knew such a luscious flavor would also be a stimulating food? Ancient peoples of the Americas did. Cacao, cocoa, and chocolate are different terms, but all come from the same tree. The word cocoa is an Anglicized version of cacao, and the word “chocolate” has roots in native languages of the Americas. What is chocolate? Chocolate is obtained from the cacao tree, a tropical evergreen known as Theobroma cacao (which translates from Greek as “food of the gods”). 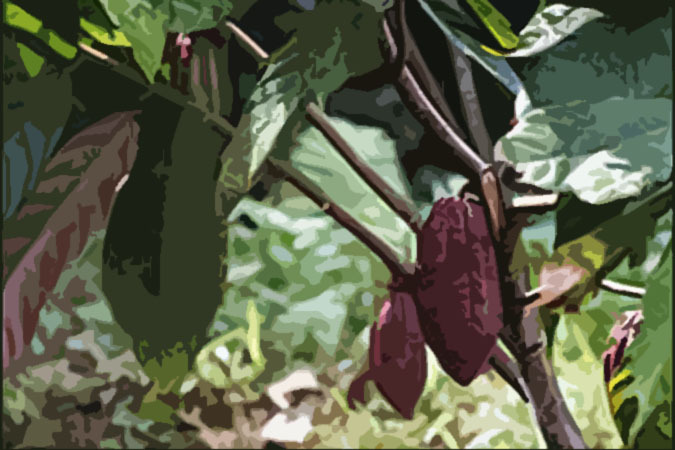 Each large cacao pod yields about 40 seeds or “beans” which are fermented, dried, and roasted. They’re then processed into cocoa solids, non-alcoholic cocoa liquor (a mix of solids and fat), and cocoa butter, the essential ingredients in chocolate products. Cocoa butter is the fat, with no caffeine or other stimulants. Cocoa liquor and solids are processed into eating chocolates and cocoa powders, sometimes with cocoa butter added back in. What are the typical types of eating chocolate? Solid chocolate is basically finely ground cocoa solids suspended in cocoa butter. The more solids, the darker the chocolate, and the more stimulants contained. Milk chocolate includes milk and sugar, with less cocoa liquor or solids. White chocolate isn’t true chocolate; it contains cocoa butter and no cocoa solids or liquor. Many dark chocolate bars promote the high percentage of cacao on their label, as in 72% chocolate (the combined weight of the cocoa solids and cocoa butter; the rest is usually sugar). Mass market chocolates often contain almost no real cacao, as little as 10% chocolate liquor which is the minimum required by U.S. regulations. Cocoa powder is dried cocoa liquor, ground and unsweetened, and used in cooking and beverages. Instant cocoa powder has sugar added. Unsweetened chocolate is mainly for baking and cooking, and is known as bitter, baking, or unsweetened chocolate. Semi-sweet or bittersweet chocolate contains a high percentage of cocoa liquor and solids, and some sugar. Cocoa nibs, or cacao nibs, are the crunchy inner bits of roasted cocoa beans, and are added to recipes for texture and flavor. Where does chocolate come from? Cacao trees are native to tropical rainforests in South and Central America, but now grow in equatorial zones around the globe. West Africa produces 70% of the world’s cacao, led by Ivory Coast, and followed by Ghana, Nigeria, and Cameroon. Indonesia is the world’s second-largest producing country. Producers in the Americas include Brazil, Ecuador, Dominican Republic, Colombia and Mexico. What else does chocolate contain? Some people say they’re addicted to chocolate, and there may be some truth to that. Chocolate sparks several feel-good chemicals in the brain. Anandamide is a mood-altering substance in chocolate, and also occurs naturally in the brain. It’s related to THC, the psychoactive compound in marijuana. Chocolate causes the brain to release the neurotransmitter phenylethylamine (PEA), known as the love-drug because it’s released when we fall in love. Chocolate has a small amount of tryptophan, which stimulates serotonin, and in high quantities promotes good feelings. Flavenoids and antioxidants in chocolate have been linked to cardiovascular health benefits.